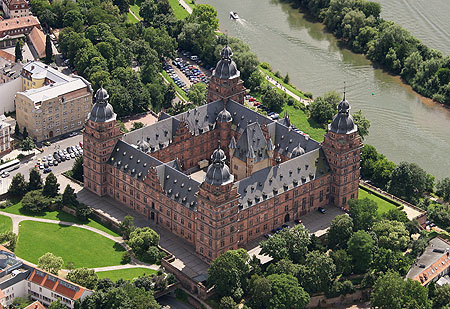 Johannisburg Palace, until 1803 the second residence of the archbishop-electors of Mainz, is located in the centre of Aschaffenburg by the River Main. The massive four-winged complex, built from 1605 to 1614 under Archbishop-Elector Johann Schweikard von Kronberg, is one of the most important examples of palace architecture from the German Renaissance era. For this new building, the Strassburg architect Georg Ridinger retained only the keep of the original medieval castle, which became the fifth tower. At the end of the 18th century, the interior of the palace was redesigned in the Neoclassical style from plans by the architect Emanuel Joseph von Herigoyen. After serious damage during the Second World War, the exterior of the palace was restored, beginning with the exterior, and in 1964 the first period rooms and collections with the rescued furnishings were reopened. The following sections of the palace are open to visitors: an art gallery with works by Lucas Cranach the Elder (a branch of the Bavarian State Painting Collections), the Palace Church with the Renaissance altar, pulpit and portal sculptures by Hans Juncker, the Vestment Chamber with vestments from the former Main Cathedral treasury, the Princely Apartments with Neoclassical furnishings and the Municipal Palace Museum. One particularly unusual attraction is the world’s largest collection of cork architectural models. 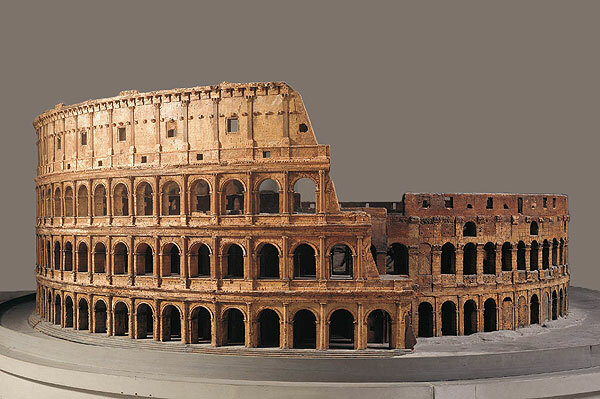 Entitled Bringing Rome across the Alps, it consists of 45 models that provide an entertaining tour of ancient Rome. These remarkably detailed reproductions of the most ancient buildings in the Eternal City were made between 1792 and 1854. They include the Colosseum, the Pantheon, the triumphal arches of the emperors Titus, Septimius Severus und Constantine, the Porta Maggiore and the Pyramid of Cestius. The architectural models were made by the court confectioner Carl May (1747-1822) and his son Georg May (1790-1853). The cork material was ideal for imitating the weathered stone surfaces of the centuries-old buildings. The altar of the Palace Chapel, the main work of the sculptor Hans Juncker that he created from 1609-1613, is presented by the Palace Department in a new light with the help of modern technology. The Juncker altar was already described long ago by Georg Dehio as ‘one of the most exquisite sculptures of the time’. A light and sound installation brings the 31 alabaster sculptures and almost 150 relief figures to life and picks out the main themes from the wealth of detail. Additional information on the materials and restoration provides an insight into the techniques used to make the altar and the changing fate of this work of art that was badly damaged in the Second World War. The Ridinger Hall is suitable for concerts, lectures, exhibitions, receptions and banquets up to 199 persons. The Tower Room is suitable for receptions and banquets up to 100 persons. The Staircase Hall is suitable only for receptions up to 120 persons. The palace chapel is suitable for religious services, catholic weddings and concerts up to 112 persons. The palace courtyard is suitable for concerts, receptions and markets up to 6,000 persons. Due to extensive renovation work the art gallery (branch of the Bavarian State Painting Collections), the Vestment Chamber and the Princely Apartments are closed until further notice. The palace chapel and a large part of the cork model collection (here only the room with the Pantheon model is closed) can still be visited. We ask for your understanding for the restrictions.